Boat building: Andrew Edwards reviews Tortoise in a Nutshell’s opening performance at Manipulate 2017. Fisk by Tortoise in a Nutshell at Manipulate 2017. Photo: Jens Peter Engedal. Tortoise in a Nutshell’s development has been gradual, building year-on-year alongside deserved critical acclaim at the Edinburgh Fringe for works including The Last Miner (2010), Grit (2012) and Feral (2013). Six years ago they presented their first work at Manipulate 2011, and this year they return to open Manipulate 2017 on the main stage at the Traverse with Fisk, now occupying a position as one of Scotland’s most innovative and versatile visual theatre companies. 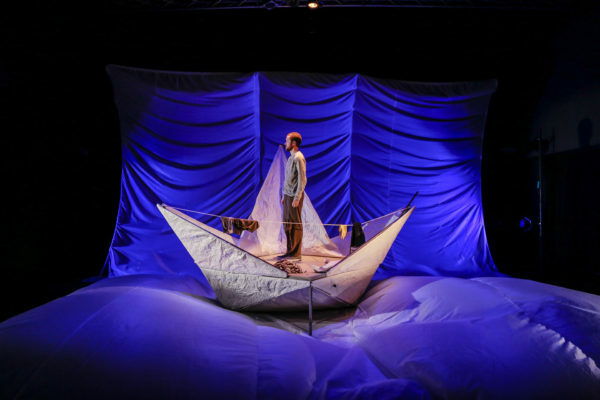 Fisk is a story about a fisherman (Alex Bird) sailing in a flimsy paper boat across stormy seas. Lost, alone and desperate, the man looks out to sea and readies himself to plunge into the water when, just in time, he is joined by a colourful, sparkling and extroverted fish. Together they struggle through an uneasy relationship, him always on the verge of sinking to the murky depths, and her relentlessly trying to keep him afloat. Fisk is a beautifully made piece of visual theatre, continually presenting its audience with memorable and evocative images. Our sailor’s white boat floats precariously on a sea of silk crashing and tumbling over a mirrored floor. First his boat and then his puppets and then his body all become stained with the same black substance; dark thoughts that can’t be un-thought. Outside the larger set-pieces, the Tortoise in a Nutshell team expertly convey large currents of emotion through simple puppets and subtle gestures, filling the work with delicate touches. The composition creates an atmosphere of a seemingly bottomless depth, foreboding and inviting, drawing in the room. The result is a work that quite accurately maps the subtleties of these conditions: their capacity to vary, their seemingly inherent humour and silliness, their ability to spiral and stain, the constant, almost daily, micro skirmishes and frustrations. The work to its immense credit also has the insight to open depression out beyond the individual through the character of the fish, played with an infectious joy by Arran Howie, who is also decked out in the best fish costume that will ever flap about a Scottish stage. Beyond offering well-needed breaks of humour and warmth, the character also draws attention to how depression as an illness never is contained to one person, but in fact spills over into those closest. As the fish tries dancing, singing and face-slapping to cheer up her companion, we’re reminded of how difficult this relationship can be from both sides, and the weight of dependency that can grow under these circumstances. Fisk closes as the man and the fish sit opposite one another, slowly practising the folding pattern of making your own paper boat, a gesture seeming to suggest a long process of building, healing and recovery lies ahead. Such an image evokes the open-ended nature of how mental health is better managed, yet this closing image also raises some underlying tensions within the work, namely that building such small boats – with enough space to contain one man and only his very nearest and dearest – is never likely to be that sustainable. Ultimately what might be read as a hopeful ending, about building again, seems to run into the same problems of isolation and over-dependency all over again. They are, after all, building the same boat that didn’t work so well the first time. Perhaps the issue is that the depiction of mental health presented in Fisk is still too narrow, contained at its widest within the dynamics of one relationship. These can never be the most stable of foundations, we might instead need larger structures, bigger networks of support where dependencies are spread wider. Communities, networks, all moving together. Wherever it is we’re headed to, whatever the conditions, we might need to think about building bigger boats. Fisk was performed as part of Manipulate festival 2017. Click here for more details.